From moon to moon whole worlds change. the deepest levels of the soul. but not knowing how to begin. But the key is listening. but first we face our fears. with deepest part of our soul. is what this journey is all about. Here are the MYSTIC MAMMA Astral Insights woven from the collective guidance of our beloved featured astrologers. “Scorpio and Pluto are powerful medicines asking everything of you before granting the joy of rebirth. 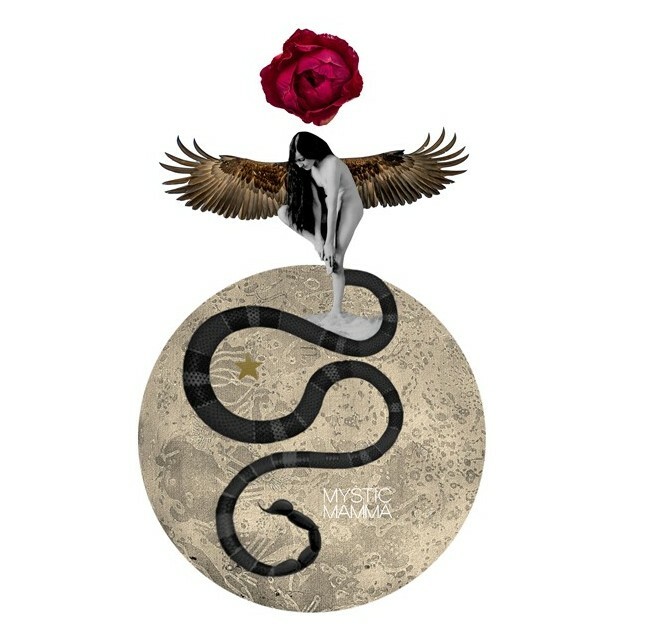 “At the Full Moon in Scorpio, emotions are intensified as we’re driven by a need for deeper connection, empowerment and transformation. “As we teeter on the edge of the abyss, fears loom large. “If we have any hope of gaining greater insight and perception, we must face what makes us so afraid. “The complication of the Moon in Scorpio square to Ceres and the North Node suggests that there is a longing to be seen yet a terror of someone seeing the truth of who we are. “The question we’re all dealing with in some form or another is, do I trust you enough to show you all of me? “The more we learn to trust both ourselves and others, the greater the chance for commitment and longevity in all our relationships. “I want to point out the Chiron/Juno conjunction at the Aries point…a powerful alignment of the Wounded Healer with the asteroid Goddess of partnership and marriage- at the very first degree of the entire zodiac! “The Aries point speaks to massive new beginnings being seeded. “With Juno part of this can be in regards to relationships and partnerships in our lives- and also in regard to patterns we have played out in relationships and partnerships in our lives for our entire lives (or maybe lifetimes!). “Chiron’s involvement is bringing to stark awareness any wounding patterns that run us in partnership. “Our relationship to Mars/Aries energy is undergoing a massive healing (but also activation of old wounds so we can see what needs to be healed)- and facing our reactivity/aggression/immaturity/control issues OR our disconnection for our anger/agency/will/healthy ego self is key. “Big stuff is up right now in how we do relationship! “You can start a brand new chapter or even volume in your relationship history if you like. “Existing relationships could rise up and evolve/transform together. In other cases relationships have to be left behind in order to start on a new, healthier relationship trajectory. “By what we let go of, we can move forward with determination and will to part the veil and enter unknown zones, leaving fear and egocentrism behind. “This Full Moon is stabilizing, expansive, clarifying, and brings rewards for courage. “…Ultimately, this is a degree of ‘comradeship.”…From these symbols it seems we can see the light of a greater dedication and consecration expressed through gathering with others and feeling the closeness and fellowship generated by what we’ve done together, or what we’re doing together. Thank you from the bottom of my heart for all your support and your sharing. It has not been an easy journey, but we are continuing to blossom. May we find comfort knowing that we are not so separate as we feel. We are actually more alike than we know! Thank you MM for this deep and exquisite group of insights. Born under natal Moon in Scorpio and with a father whose sun was in Scorpio, this time is very nurturing for me as it draws me to the Scorpio healing deep waters where I sometimes long to be to be whole by sharing these gifts. Namaste. I wept and wept as I read this. Powerful for our Interfaith Peace Walk tomorrow in Philadelphia Pa tomorrow and May Day. Thank you! WHOPPIE!!! Another wonderful time to be alive! 🐬🐬🐬🐬 the intensity is palpable. My love to all with grace and well being. Thank you so much for your truthful insight. Keep shrarinh! Powerful change coming and allowing – through the fire of judgemebt. Peace to all im hanging on. Sending love to both of you! Thank you for the insights! Baby boy still waiting, now 5 days after due date and I am hoping this Full Moon brings him to us this weekend! Time for love and new birth. How exciting!! Congratulations!! Things are always working out for you!! As always so much truth and insight. WOW lots to come and hold on to our hats. Thank you so much MM! So grateful for you! Thank you! So comforting and supportive. These last few weeks have indeed been like walking through fire for me. My birthday was on the 15th, and my anniversary was two days later, but neither could really be celebrated or even enjoyed as I lost my job on the 10th and my husband was/has been busy going through some very heavy, transformative things that have been affecting and challenging both of us. I understood and resonated with all of this on a deeply personal and spiritual level, and I am trying hard not to let fear and crippling anxiety get the better of me. I’m so tired of being plagued by worry and doubt and feeling the damage caused by old patterns. I can only hope that, especially with some intention and faith on my part, I can be transformed and healed for the better during my time of year. I hope all of us that are struggling right now will find the peace and healing we need and deserve. Love and hope to all, and the blessings of the Ocean and the Great Mother. WOW! As always, you are an Amazingly gifted Being, MM! Thank you so much for sharing your wisdom with the world. I began a new series of work this past week, called the Moon series that incorporates my underwater diving feminine work and the moon. I have not been reading astrology except for yours and am always blown away how I see my work and your words and gorgeous art relating to each other in there own unique way. It brings me so much joy to feel that I’m not alone here and there is this big shift happening and how powerful and beautiful our connections are on this plane and the higher ones. Feeling so grateful and sending you much love and light. Thank you! XOXO! Thank you. These times are challenging for physical health and I’m grateful for your astrological collections at the new and full moons. We go back to move forward. We reach inside to grasp outside. We are there so we can be here. We become blind to see the light. We unbecome in order to be. Thank you for being with me as I awake. between moons I’ve found out I was pregnant and fought so much with the father. I’ve also fought with the idea of keeping or not keeping the baby. we have separated and everything I’ve been thinking and feeling aligns with these words… conquer my ego and do what’s necessary to stay together or strike out on my own (with the help of my village) and have the rebirth/change in my relationships I keep reading about. knowing which path to choose has not been easy. I’m still not decided. every day since march 16th has been painfully intense. i wish there were an easy way to make these decisions. your work is helpful. thank you. Thank you for this amazing text!